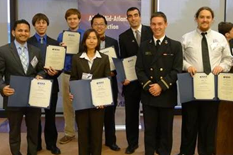 Aerospace Engineering students excelled at the American Institute of Aeronautics and Astronautics (AIAA) Region I Young Professional, Student, and Education (YPSE) Conference 2014. Students placed across four categories, winning for both best student presentations and papers. The AIAA YPSE conferences highlight the future of aerospace engineering from students and young professionals from kindergarten to age 35.